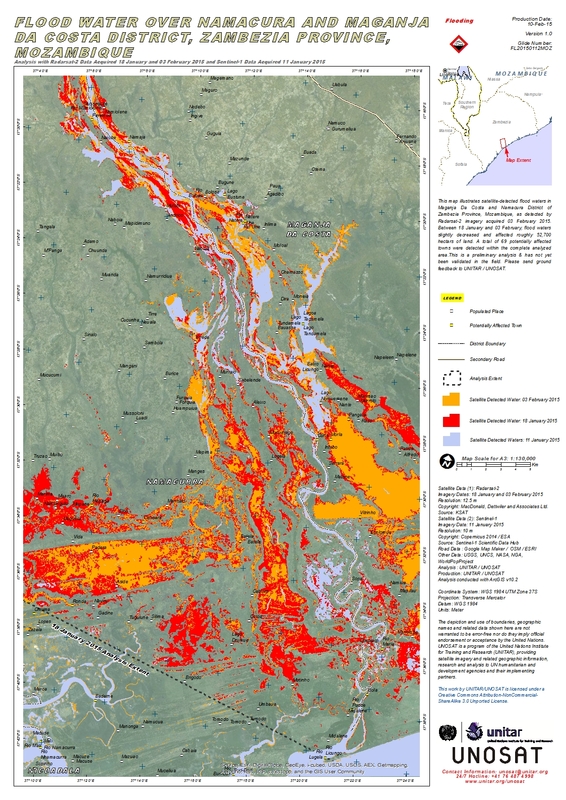 This map illustrates satellite-detected flood waters in Maganja Da Costa and Namacura District of Zambezia Province, Mozambique, as detected by Radarsat-2 imagery acquired 03 February 2015. Between 18 January and 03 February, flood waters slightly decreased and affected roughly 52,700 hectars of land. A total of 69 potentially affected towns were detected within the complete analyzed area.This is a preliminary analysis & has not yet been validated in the field. Please send ground feedback to UNITAR / UNOSAT.